In Ghostbusters, the addition of Winston to the team, halfway through the movie, always struck me as a bit odd - even as a kid. Apparently the character was written into the script to show just how busy and overwhelmed the Ghostbusters had become, but that could be - and was - capably handled by a montage set to some catchy theme music. The role was originally written for Eddie Murphy, but it was later decided that, with three comedians in the main roles already, the 'busters needed a "straight man," and so the role was rewritten and Ernie Hudson was brought in. Ultimately Winston was a great addition to the team, but his appearance so late in the movie, after the audience has come to love the close friendship between Egon, Peter and Ray, leaves him seeming a bit like an outsider. Fortunately, he gets some of the best lines in the second half of the film. If you bought Egon or Ray, you know what you're getting. It's the same body once again, and since Mattel is comfortable using the same body over and over, I think it's fine for us to recycle our comments on it. Also we're lazy. "From the neck down, the sculpt is superb. The excellent detailing of the equipment and clothing, as well as the scale, reminds me of Plan-B's Special Forces figures." This body size does work fine for Winston - in fact, he and Peter are both the right size for it. It's Egon who's a bit too slender and Ray who's a bit heavier than this basic body. 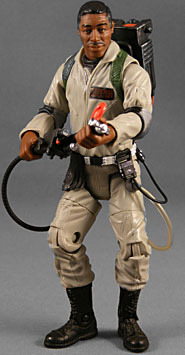 As for the neck up, Mr. Hudson has the best likeness of any of the Ghostbusters so far. And yet... while the prototype was perfect, the production process on these figures continues to soften the sculpt, and therefore the likeness. So while there's no question this is Ernie Hudson, the longer you look at him the weaker the resemblance becomes. The paint work looks nearly identical to the other two figures, so there's not much to report there. The paint work on the figure's head is pretty clean. The 6" Ghostbusters are molded primarily in the color of their suits, and you can tell that. So there is a certain toy-like quality to these figures that you don't see on a NECA or McFarlane figure. As we've often said, that's not something that's too bothersome, but there are those whom find it so. Winston has a balljointed neck, swivel/hinge shoulders, elbows and wrists, H-hips, hinges at the knees and ankles, and swivels at the waist, lower thighs, and the top of the boots. Something about the H-crotch on these figures makes them looks slightly unnatural in bent poses, as if the hips were a bit lower on the body than they should be. The accessories are easily the most exciting part of getting Winston. He comes with a ghost trap, complete with a removable cord for the foot pedal, and a removable blue energy ball to represent the opened trap. The trap itself has two doors that open and close. It's a great accessories, well fabricated, and add a lot of value to the figure. However, it's not perfect. The trap itself can't stand up straight when the energy is in place; I had to glue mine down in my display with some adhesive putty. Also, the cord for the foot pedal is pretty stiff, and since it's curled in the package, it's difficult to get it to lay flat on the ground. It is possible to set Slimer in the energy swirl, and in fact when he's in there he adds enough weight to allow you to balance the trap without help. But something like a removable clear peg that would allow Slimer to hover over the trap would have been a great - and cheap - additional accessory. 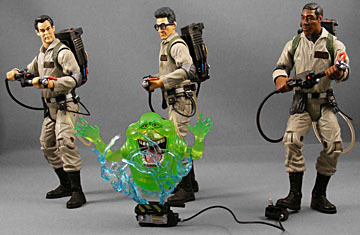 However, you can leave Slimer on his swooshy stand and work it through the energy tendrils, and have him hover that way. Some fans have expressed concerns about the cord at the base of the neutrona wand tearing, but I haven't run into that yet. You have to admit it's a bit hard to get excited about these figures. A large part of that is the body re-use, but to be fair, they're also somewhat bland in their original design - just four guys in beige jumpsuits. 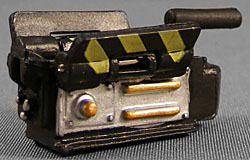 The trap goes a long way to making the figure more interesting, and it'll be great to place it inside the containment unit that comes with Walter Peck. But I'm starting to see why the cartoon designers gave each of the Ghostbusters their own distinct color uniform... that bugged me as a kid, but now the prospect of The Real Ghostbusters in 6" form, with more articulation and a Four Horsemen sculpt, is becoming more and more appealing.